Where do actors nominate other actors for top awards in the profession? Only at the SAG Awards. This year, the landmark 25th annual SAG Awards ceremony took place on Sunday, January 27, 2019 om TNT and TBS beginning at 8PM ET as the cermony was televised live from the Shrine Auditorium in Los Angeles. For the first time ever, your host for the 2019 Screen Actors Guild Awards was Megan Mullally, star of From NBC’s Will & Grace. 2019 SAG Awards nominees were announced on December 12 which annonced the leading contenders for Outstanding Performance by a Cast in a Motion Picture (SAG's equivalent of Best Motion Picture). They included “A Star Is Born”, “Black Panther” (WINNER), “BlacKkKlansman”, “Bohemian Rhapsody”, and “Crazy Rich Asians”. “Better Call Saul”, “The Handmaid’s Tale”, “Ozark”, and “This Is Us” (WINNER). Tom Hanks will led the list of all-star presenters on the big night. Joining him was Angela Bassett, Adam Driver, Bradley Cooper with Lady Gaga, Ben Hardy, Joe Mazzello, Gwilym Lee, Rami Malek, Chadwick Boseman, John David, Ken Jeong, Constance Wu, Michelle Yeoh, and Sam Elliott. Additional appearances included Chris Pine, Keri Russell, Awkwafina, Laverne Cox, Matt Bomer, Richard Madden, Tracy Morgan, Alec Baldwin, Ricky Martin, Scott Bakula, Antonio Banderas, Gabrielle Carteris, Glen Close, Michael Douglas, Jodie Foster, Hugh Grant, Gary Oldman, Anthony Ramos, Rachel Weisz, and Robin Wright. Just up ahead, check out the complete list of 2019 SAG Award winners, along with interesting fun facts and trivia behind the Screen Actors Guild Awards. • Actor Jamie Foxx holds the record for most Golden Globe nominations in a single year when he competed in three individual categories for “Ray”, “Collateral” and “Redemption: The Stan Tookie Williams Story” in 1995. • The actress with the most nominations in a single year is Maggie Smith who received two nods for “The Best Exotic Marigold Hotel” and two for “Downton Abbey” in 2013. • The record holder for most nominations for a TV show is the hit comedy "Frasier" which was nominated nine times, winning only once in 2000. 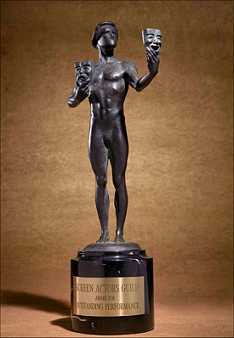 • The Golden Globe statuette is called The Actor, and weighs a hefty 12 lbs. or about the weight of a bowlig ball. It is made of solid bronze. * Tony Shalhoub, "The Marvelous Mrs. Maisel"
SAG Awards Official Web Site - The focus on official Screen Actors Guild members, with details on nominating categories, submissions and timelines, press kits and current news. Screen Actors Guild - SAG History - From the official community site chronicling the establishment of the guild in 1933 with cool Flash presentations, photos, activities and timeline. Screen Actors Guild - Wikipedia - Covering the union's original Masquer's Club members in 1925 to its official founding in 1933, along with issues and controversies, current awards categories, history and trivia, related resources.